If popularity is the game, then Bitdefender would no doubt land one of the top spots, having more than 500 million users. Not very surprising, given the continuous improvement of the software’s interface and the constant updating of its extensive database of signatures. 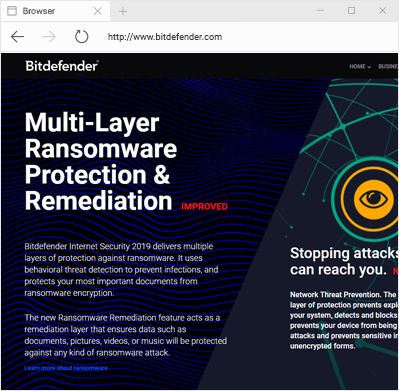 Founded in 2001, Bitdefender has come to be one of the most trusted antivirus and antispyware programs in the market – a fact that both home and business users can agree on. What is not to love about Bitdefender? It protects computers and mobile devices from viruses while protecting them from cyber threats and online attacks. This is not just talk, as the software has been tried and examined by many individual testing bodies like AV-Test, which gave Bitdefender the Best Performance Award for 2015 and PC Mag which granted the software the title of Editor’s Choice for Security mega-Suite in October 2015. BitDefender Antivirus Plus 2018 (from $59.95/year). Provides reliable antivirus and antispywareprotection against cyber attacks while securing your identity and online transactions without making an impact on the performance of your system. Delivers one-click security for up to three devices. BitDefender Internet Security 2018 (from 79.95/year). Optimizes system startup and gives up to three of your devices security against cyber attacks, a two-way firewall that prevents unauthorized users from accessing your files and data, and highly effective parental controls to monitor and restrict your children’s Internet usage. BitDefender Total Security Multi-Device 2018 (from $49.95/year). Delivers 3-in-1 protection for up to five different devices running on Windows, Android and Mac OS. Quickly detects and removes new malware while providing identity, data and financial security. Installing the software is pretty straightforward, but you cannot do it while you are in the middle of something, as you are required to restart the PC in order to complete the installation. Restarting is also required in uninstalling the program. Bitdefender featuresan easy to read and easy to use interface that allows users to access all the software’s features in just one dashboard. No matter if it’s parental controls, firewall settings, virus scanning or system optimization that you want to use, you can easily do so in just one window – no need to open other windows that could lead to confusion. Bitdefender is one of the best antivirus and antispyware programs available in the market today, not only because of the protection it gives but also in the way it performs optimally without compromising the performance of your computer. It actively blocks viruses from entering your system, and in the event that some threats slip through the security protection shield, they would quickly be detected and removed. In addition to this, Bitdefender running in the background does not affect the performance of your system at all. Bitdefender places higher than most antivirus applications in the market in terms of reliability, thanks to the many features it has, depending on the package. Bitdefender offers many support options, one of which is the knowledgebase you can find in the Bitdefender website. This is the go-to page for issues that users commonly encounter with the antivirus software. The website also offers some tutorials for help with some of the functions of the program. Users can also get help by calling the Bitdefender hotline or by initiating an online chat with one of Bitdefender’s tech support agents. You can also email them or call them. If the issue is not very urgent, you can also opt to read up on the Bitdefender forum about common issues. Bitdefender is highly regarded for its excellent performance, efficient real-time protection and outstanding threat detection features, which is why most people are surprised to find that the antivirus and its different packages come at really affordable prices. Not only that; Bitdefender also comes with a 30-day money back guarantee. If you find yourself even just a tiny bit unsatisfied with the protection Bitdefender provides, then you can call customer service for a refund, no questions asked. Rescue Mode. There is no perfect antivirus program, so it is not entirely impossible for some threats to get through. But Bitdefender has a solution to this issue: the Rescue Mode feature, which notifies you of the threat so you can remove it. This is especially helpful for hidden threats that attach themselves to the computer’s operating system. System Monitoring Settings. This feature keeps Windows system security patches updated, thereby lessening the possibility of online threats. Vulnerability Scanner. This feature scans your computer and notifies you about outdated or missing software, so you can make the necessary modifications to your computer. Autopilot mode. When selected, this feature takes care of detected issues on its own, without disturbing you with pop-up alerts. USB Immunizer. This feature blocks unwanted malware from USB drives. Internet Security. This feature monitors and block malicious websites, scans emails and filters information so none of your critical data ever leaves your PC without your authorization. Top of the line performance, safe and secure browsing, zero impact on computer performance and an interface that is a breeze to read and use all wrapped in affordable packages – this is what Bitdefender is all about. Bitdefender’s wide range of features and functionality is topnotch, which is why the software unsurprisingly wins awards year in and year out.